The narrator decides to investigate the truth of the story, tracking down the wife and visiting her under the pretence of buying her villa. While he is there a man appears claiming to be the husband but, of course, the wife has no way of recognising him. As the narrator leaves he sees another potential husband approaching. The narrator’s point seems undeniable, until, that is, he begins to create his own portrait of Babakuans as a strange and eccentric race. The title story, too, is touched by suicide; in others, the darkness seems to come from the time they were written (the early stories are dated). ‘Greetings for Dante’ (though given its own context by the story, the title is a clear reference to Hell) in particular seems an imagined response to Franco’s dictatorship. On a more light-hearted note, there are some particular delights for Vila-Matas fans. ‘Sea Swell’ reads like an out-take from Never Any End to Paris as Vila-Matas visits Marguerite Duras hoping to rent a flat from her but having unfortunately taken amphetamines beforehand. In ‘Invented Memories’ we see him at his playful best in a tribute to Antonio Tabucchi. 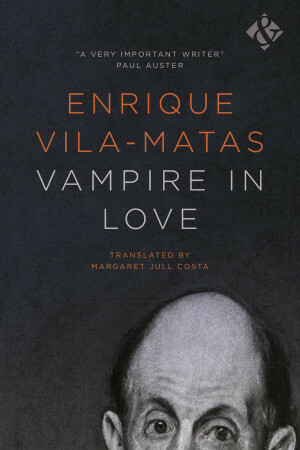 Vampire in Love is not only a must for any admirer of Vila-Matas, but a fantastic introduction to his work if you have never read him before. And if you’ve never read him before, what are you waiting for? This entry was posted on October 30, 2016 at 5:44 pm and is filed under Enrique Vila-Matas. You can follow any responses to this entry through the RSS 2.0 feed. You can leave a response, or trackback from your own site. I’ve read one so far which I *did* like but I’ve never got round to picking up another. Sounds like I could do no better than to track this one down! Having read all of his translated novels bar one, I found this a delight and it did make me wonder if I actually preferred his short fiction! I loved is short piece printed in the Two Lines 25. I am looking forward to reading this one! Was that one which is included in the book? I’m sure you will enjoy this! As you know, I loved Never Any End to Paris, so Sea Swell is of particular interest to me. Do you know when these pieces were written? Are they relatively new or just coming through to us in translation? As I alluded to, some of the stories have dates attached (1974, 1975, 1977, 1981) but most don’t – I made the assumption, perhaps incorrectly, that these were the older stories. They certainly come form a number of different books originally. I think you would love Sea Swell! I’ve somehow never been tempted to read Vila-Matas, and I haven’t even read Borges yet so I probably need to do that first. I do note though your comment that this is “a fantastic introduction to his work if you have never read him before.” Is it also a short introduction? Anyway, given the strength of your recommendation I’ll take a look. Vila-Matas (like Borges) is not to everyone’s taste, but I do think that his short fiction is a good entrance point – especially as you don’t need to read all at once!